ll parents want their children to be “well-behaved” and so they discipline them. I believe that some kinds of discipline are more effective than others. But ultimately our task is to teach children self-control so they can navigate through life all by themselves. One way to improve behavior is to reinforce a behavior by giving rewards. When a child does something positive, praise her verbally and sometimes give her a reward. By doing this she will consciously and unconsciously learn to repeat the behavior. For those of you who use my rewards chart “Be A Star” the reward is getting points and moving towards the happy star; eventually this translates to a reward of the child’s choice. Children see their marker go up and they realize that they actually have control of their own behavior; a behavior which can bring good things. Some people may consider this bribing, but all people and animals are motivated to act or try something new because of a potential benefit. Most people would not get up for work everyday if they were not paid. In the same way, children need encouragement to behave in a new way. Very young children want to please parents and this may be enough of a reward. However, as children age, they have a mind of their own. They want to do things their own way, which often does not coincide with the parent’s point of view. This is the moment at which the principles of behavior modification are effective. 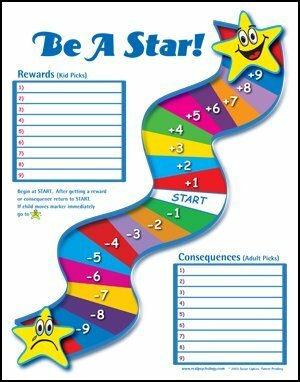 As the Be A Star chart demonstrates, parents should respond to negative behaviors by giving some kind of negative feedback verbally, and if using the rewards chart, the child’s marker moves down, towards the unhappy star, and a consequence of the parent’s choosing. This behavior modification system, positively and negatively reinforcing behavior, immediately and concretely, works because it is balanced and fair. It allows children of all ages to actually see how they have a choice…to behave in a way that earns them rewards, or to behave in a way that earns consequences. Another reason that Be A Star works well is that the parent feels in control of herself and the situation. Instead of yelling or threatening, the parent simply and immediately responds, by giving or taking away points. This empowers the parent. Both the parent and child learn self-control. When parents are in control children are in control. This occurs because everyone learns by mirroring. This is a concept that Mother and daughterneurologists and psychologists have found to be the primary way that learning takes place. Children mimic parents. They do what we do; not what we say. Classic examples include alcohol consumption. Children of big drinkers, grow into big drinkers themselves. Children of obese parents tend to be overweight. Children of smokers are more likely to smoke. Children of bullies tend to be bullies; and children of victims tend to be victimized. Children of divorced parents are more likely to get divorced themselves. Children who have been abused are more likely to abuse. If we want our children to be in control then we, as adults, need to model behavior that is positive. We as adults need to have self-control. For example, parents who read tend to have children who like reading. Parents who eat healthy foods are likely to have children who eat well. Parents who respect others and treat all people equally are likely to have children who do the same. Disciplining our children begins when we, the parents, demonstrate self-discipline; self-control. Being a good role model is essential however, it helps to reinforce behaviors by giving positive or negative feedback, and sometimes, it helps to provide rewards or consequences. Observe yourself, your spouse and any other caregiver in your family. Are you modeling self-control? When you are stuck in traffic (especially dads). When you are late for something important. Are you maintaining control over your own behavior and emotions?